One of the most important tables in the Check Point firewall is the “connection kernel table”. Connections kernel table contains the specific information about the current connections (source, destination, protocol, timeout, etc etc etc). The direction of the connection is set by the first packet of the connection even though the connection may be bi-directional in reality. From my point of view all systems should be set maximum concurrent connections to “automatically” (see picture). Alternatively, you can toggle it to manually here. I wouldn’t advise it, though. In most cases this is also set as default by older versions. If you use this, then please use it described below. Aggressive aging is activated in IPS profile, or new connections may be dropped for the reason that the connections table is full when a given CoreXL firewall instance has far fewer connection entries than the connections table limit, or the 80% threshold to activate aggressive aging as seen in the output of ‘fw ctl multik stat’ command. With the following command you can find the number of active sessions for „TCP start timeout“ in the connections table. If you change the value in “grep” you can also show other session timeouts! Note: A high number of „TCP start timeout“ could also indicate a DDoS SYN flood attack. In the area of Distributed Denial of Service (DDoS), TCP SYN flooding was one of the first attack vectors that was encountered and it has remained significant even now. The TCP handshake process, which starts with a TCP [SYN] packet, requires that a server allocate a transmission control block (TCB) for incomplete and half-open connections. More see here “Best Practices – DDoS attacks on Check Point Security Gateway”. 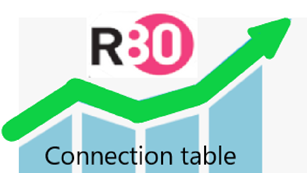 Under R80.20 there is a new command that in conjunction with the “Dynamic Dispatcher” displays connections with a high load. That’s where I mention that CLI command here although it doesn’t quite match the theme. This command shows the table with heavy connections (that consume the most CPU resources) in the CoreXL Dynamic Dispatcher. For more information about the CoreXL Dynamic Dispatcher, see sk105261. An important point in tuning is the order of the rules. Normally the “rule counter” helps here. Rules that are often used should be at the beginning of the ruleset. Another important point is the session timeout for a service. 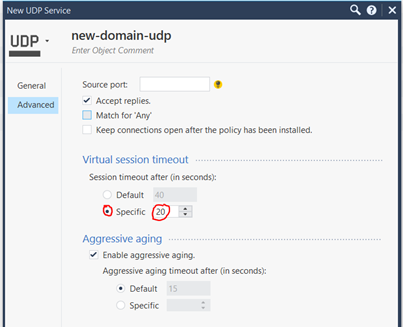 For example, the default session timeout for UDP is set to 40 seconds (TCP to 3600 seconds). This means, for example, that each DNS request is kept open for a maximum of 40 seconds after the last package. That’s a bit much from my point of view! Therefore it is possible to change the virtuall session timeouts in the service. I always test here with about 20 seconds (see picture) and adjust it a little bit upwards or downwards. So the DNS requests do not remain so long in the connetion table. This can also be applied to other services.